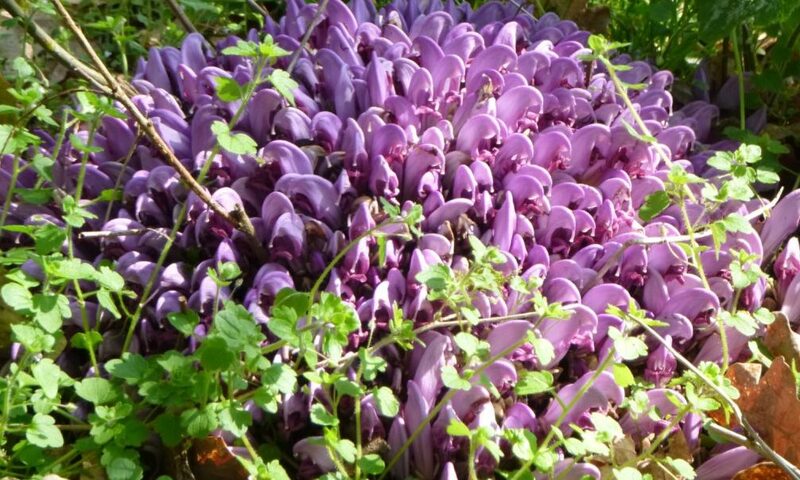 Home > Heath News > Purple toothwort – what a strange plant! Purple toothwort [Lathraea clandestina] is an unusual parasitic plant native to many parts of Europe but a rare introduction in the UK. This example was found in a boggy part of our local woodland. The plant has no leaves or chlorophyll but lives on the roots of trees in damp areas including willow, alder and poplar. It is also semi-carnivorous, trapping insects below ground. Purple toothwort flowers in March/April/May after which it fruits and then disappears below ground until flowering again the following spring. Seed and plants are available from specialist nurseries although it may take many years for the plant to first flower.